Who wants a creepy story just in time for Halloween season? Store your flour in sealed containers, please, not the box or bag in came in, ok? This was a lesson I thought I had learned during the great pantry moth infestation of ’09 and the pantry invasion of “tiny things with legs” of ’10. Apparently not. I had one box of cake flour in my pantry, a.k.a. my hall closet, and in my first attempt at these dumplings, I thought I would try cake flour for a lighter texture (or because I was also out of regular flour). Whether the cake flour achieved the desired lighter result I’ll never know, because just before taking my first bite I realized the dark flecks in the remaining flour in the bag seemed to be moving. Cue fork clattering to the ground. I was on the phone with my mother at the time, who seemed unreasonably calm about my consuming mystery bugs, so I did a hasty google search which told me that these creepy crawlies were probably weevils, and that since they were living in flour that had been sold in a sealed plastic bag, they likely originated at the processing source, not my closet (but even so my improper storage could have led to them infesting other dry goods!). It also assured me I wouldn’t die from eating them, but I couldn’t stomach it and so there went a ton of ricotta and butter into the trash, along with the rest of the flour. Please don't ever sign me up for that Fear Factor show at Universal Studios. Calmer, and after purchasing brand new flour, I tried again, and I'm glad I did because these cheesy delights are worth the effort, which is actually pretty minimal. Along with the previously mentioned flour, you combine ricotta, parmesan, an egg, and flavorful mix-ins to form a dough that you then plop into simmering water before turning golden in a tanning bed of brown butter and sage. I’m not actually advocating for cake flour in these, since I tested a different recipe in round 2 and my freshly purchased AP flour worked out just fine. I am however, going to advocate for a high-quality ricotta that you promise me to drain if it seems overly wet or loose. These dumplings are 90% ricotta so we want it to taste amazing, and we don't want any extra moisture in the dough causing a total structural collapse during simmering. In the end, you end up with creamy, pillowy dumplings that taste like slightly firmed up insides of ravioli, dressed in butter and crispy sage. It's straight cozy, cheesy, Fall delight. Bring a large pot of salt water to a low simmer. 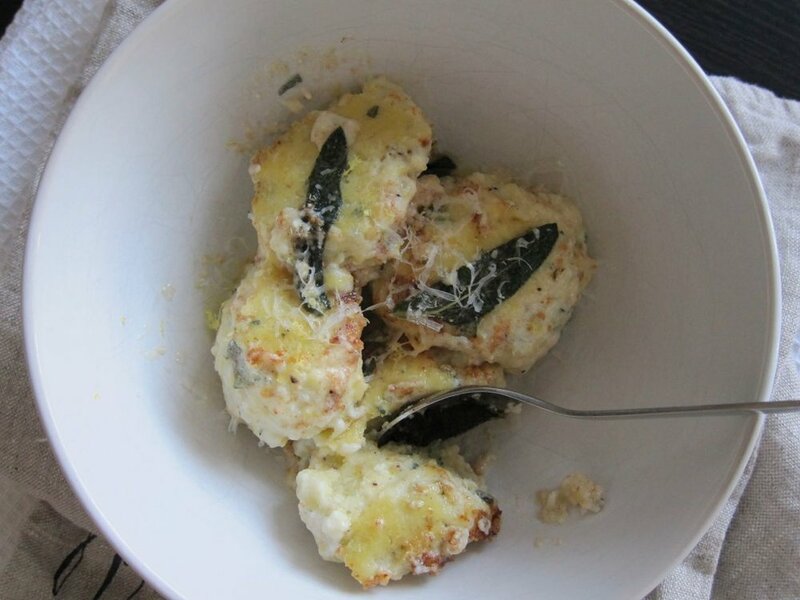 In a large bowl, combine ricotta, eggs, parmesan, pepper, salt, lemon zest, lemon juice and sage and stir well to combine. Add the flour and stir in until combined. Drop mixture by 2 oz scoops into the simmering water. Cook 10-12 minutes, until dumplings begin to float to the top. While dumplings are simmering, melt butter in a large, non-stick skillet until foaming. Add the sage leaves and cook until crispy and butter is browned. 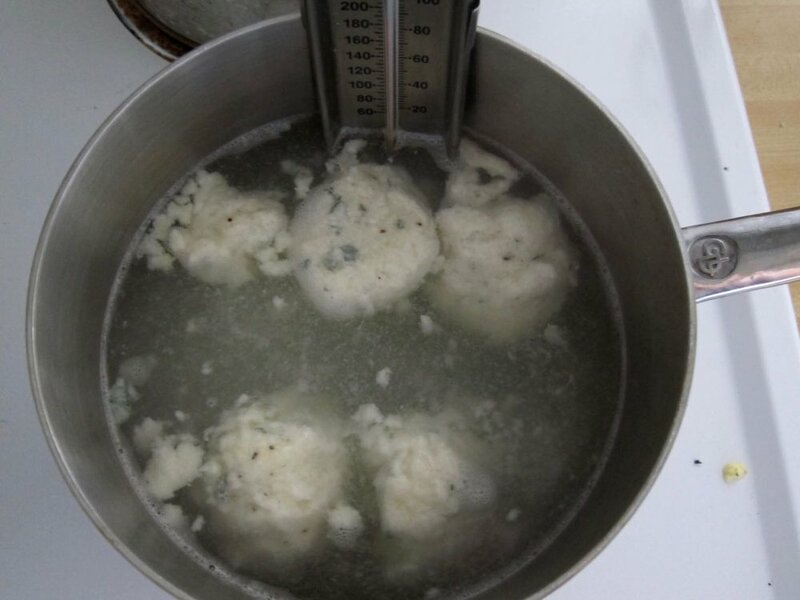 Using a slotted spoon or spider, transfer the dumplings from the simmering water to the browned butter. Using a spoon, gently brown the dumplings in the butter until golden. Transfer to a dish and serve hot with a little extra parmesan and lemon zest, if desired.